Could anyone possibly forget their first ride on a two-wheeler? Whether you were born in Stony Plain or Saigon, chances are you remember who was running alongside, holding the back of the seat steady and finally letting go. In turn, the joy of launching a new rider is equally unforgettable. This memory of carefree independence is at the heart of Recycles – a circular parade of five stationary bicycles built-for-two. At rest, the art piece is as visually dynamic as a carousel. However, with audience participation it offers a kinetic, interactive experience. Each individual sculpture was created largely from found objects to capture the pioneering attitude of making and repairing, rather than discarding. As people of all ages experience the sculpture, they will discover a seat that suits them perfectly. Grown-ups can help smaller ones to climb on, where they will be delighted to find that pedaling activates the whirligig characters waiting in the ring high above the cyclists. By bringing the sculpture to life, riders become active participants in this street performance. Before and after the show, they can identify surprising bike parts – from waffle irons to manhole covers. The sculpture is open-ended to encourage all sorts of imagined wheeled machines, with enough diversity to ensure repeat visits. Recycles’ retro look suggests the timeless pleasure of bike riding. The visually warm and active palette – that includes safety colours – conjures classic children’s picture books and merry-go-rounds. At the same time, the industrial materials used in Recycles come directly from Alberta’s place in the oil patch. Recycles celebrates the downtown Edmonton spirit with its new Arts District. The sculpture also refers to The Works, Jazz City and the Street Performers Festival – all players in the growing vitality of life in the heart of the city. As well, Recycles reflects our fabulous parks system, bike trails, and, of course, our premier position as the number one recycling city in Canada. Biographies: Lynn Malin is a Canadian artist living and working in Edmonton. She is well-known for her large landscape and still life paintings, as well as her works on Lexan with light. 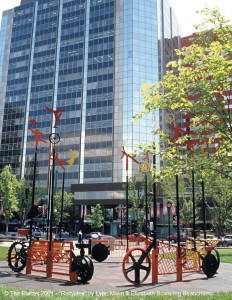 Equally, she has won several major public art commissions in the city. She exhibits widely in public galleries, and is represented by the Scott Gallery. Over the years Lynn Malin has worked in collaboration with Edmonton artist Elizabeth Bowering-Beauchamp on several aspects of art and sculptural projects. Working with Western Canadian imagery such as animals and birds and the colours found in their environment, they produced tables and monotypes that reflected their artistic philosophies. They also collaborated on installations which combined Beauchamp’s interest in video and Malin’s interest in lexan, light and landscape. Together they applied for public art projects and were successful in obtaining several public commissions. Their aim was to encourage thoughtful discourse through multi-media works of art that encourage audience participation by creating the experience of ever-changing works of art. Project Title: Beaver Hills House Park Millennium Playful Art Project.